Agnes Eleanor Lovell was born 6 Oct 1883 in Oak City, Millard, Utah. She died 30 June 1945 in Delta, Millard, Utah. 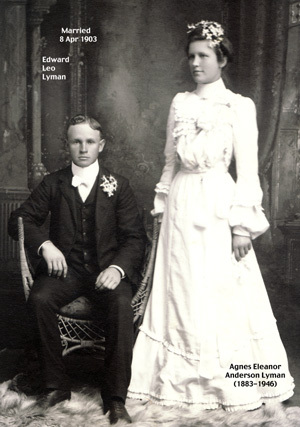 Agnes married Edward Leo Lyman Jr. 8 April 1903 in Salt Lake City, Utah. Edward was born 19 Feb 1881 in Fillmore, Millard, Utah. He died 20 Jan 1958 in Delta, Millard, Utah.